WMP11 and 12 offer a DLNA server mode as well. I couldn't get it to work reliably, so I gave up on it. You might have more luck. To remove WMP afterwards can be troublesome, consider making a backup first. Ah. TVersity. It was free, but is no longer. It's a good DLNA server / transcoder with a decent HTML interface (which got a little worse with the demise of Flash), but it has some seeking issues. TVersity is a software package that delivers media to different kinds of clients. TVersity should be / is able to convert media on the fly. If you're using a HTPC with something like XBMC or a media player that can handle any and all formats then you do not need TVersity unless you want to use any of the 'web streaming' functions. Update: Tversity 2.x improved searching behaviour. It still isn't perfect, but what is. My solution: install both TVersity and Servio, or TVersity and UMS. You might want to get a little older version of TVersity (1.9.7) if you want to go free, as the latest version of TVersity now requires payment. Not too much, but still. TVersity can be accessed in two ways: either by specifying the exact IP address + port of the TVersity server, or by searching for DLNA / UPNP devices, in which case things might or might not work. Sorry about that. The most likely alternative to TVersity is UMS, which has some advantages and disadvantages. Any DLNA client can get data from a DLNA server, in a 'stream'. Ie. the server sends video data to the client. If the client can handle that data is up to the client. If your client can browse a file server, then you won't need TVersity or Serviio. If your client cannot handle the file, you have two options: convert the file before playing it, or convert it 'on the fly'. Which is what TVersity and Serviio can do for you. For example, many DLNA clients (think: older televisions with a network connection, and 'better' brands of media players) have problems with some .WMV or .MKV files, they can't handle very high resolutions, newer H264 coded files, etcetera. to install in a different path launch the installer in XP compatibility mode and run as administrator! If you want to install TVersity on another drive using Vista, Windows 7 or 8, you have to RMB the installation file, and run in in Windows XP SP3 compatibility mode, and as administrator. Otherwise it will not allow you to specify the installation path. You might also want to install a codec pack before AND after installing TVersity to avoid some weird problems. (I know I had to on several occaisions.). Download TVersity from http://tversity.com. I've tried 1.7.2.1 beta, 1.9.7 free, and the 2.1 and 3.5 paid versions. Install TVersity. Don't accidentally install crapware like the Ask toolbar or Bablyon 8 translator (though my latest download didn't seem to include them anymore). You may opt for either installing the TVersity codec pack, or the CCCP codec pack. 1.9.7 suggests the use of the ffdshow package. Let TVersity figure out your firewall (though make sure you check the results yourself). If you did not install a codec pack yet this is the time to do so. Go for either CCCP, the TVersity codec pack, or the ffdshow package. Create a few folders and fill them up with media files (see here). Start TVersity, select the '+' icon. Start adding files or folders. You can specify if they should be listed under video, audio, or photos. Remember to check your firewall. You may or may not need an 'UPnP' entry in your firewall exceptions (TCP 2869 and UDP 1900). The entry was added on my VM, but disabling it made no difference during my tests. This may be different on your setup! Also the program / service 'TVersity Media Server' needs unlimited access to the local network as well as the InterNet. To access files on the local network you'll have do some some additional work (see below). If you have your harddrive well organised, you might want to set Settings / Media Library / Media Library Menus to 'File System'. 1.9.3 was the highest version that I could get to work on VirtualBox. For some strange reason anything higher than 1.9.3 wouldn't work on VirtualBox, but would work on a regular machine. I have tried everything but could not isolate the problem. This for those people like me that like to experiment first in VirtualBox before doing 'the real thing'. Typically I leave my VM's at 512 MB 'real' memory and 512 'virtual' memory (with a host with just 4 GB there are some limits to be observed). For my experimental VM media server (running SqueezeBox server, Calibre server, and TinyWeb) 512 wasn't enough, so I upped it to 768 'real' / 1024 'virtual'. 1.9.7 gave me some problems when doing an upgrade directly over 1.7.2.1, but a deinstall / reinstall fixed the problem. The problem didn't appear when installing over 1.9.x versions. 2.1 is no longer free but now costs $3.99. At first glance there's little new. You still cannot define the location of temporary files, for iPad integration you need to buy the even more expensive Pro version, and it still won't handle all .MKV files. It does have improved searching through streams, that is true, and perhaps transcoding is just a little smoother than before. Still, for most users the old version will work fine. So, if you're cheap, check out Serviio or use an older version of TVersity. Well, Serviio is now no longer free. And though my old key should be outdated, it still seems to work with newer versions of TVersity. A new version of TVersity, and the business model has changed again. The 'basic' version disappeared, so it's either 'free' or 'pro'. The free version isn't of that much use as it no longer transcodes... The Pro version still does. Though I wasn't planning to upgrade I actually did (I was bored). At first glance I cannot find anything seriously different, except perhaps the ability to stream to an iPad. Which frankly doesn't work well. Hmm. A pity. If you want to experiment with transcoding you'll either have to find an older version or pay. Note: to install TVersity in another folder set compatibility mode to 'XP SP3' and 'Run as Administrator'. 3.5 is also supposed to work with iPads. My copy wouldn't. Quickly following 3.5 there's 3.6. This one worked with my iPad. Some improvements, still some bugs. You don't have to do this if the files you want to transcode / stream are on the same machine TVersity is installed on. This part is only required if TVersity runs on one machine, and needs to access files on another machine (or NAS). Create a user 'TVersity' on the server containing the files you want to access (or use some other username you like). Select 'Properties' of the folder to be shared. Add the user 'TVersity' to Shares / Permissions, as well as to 'Security'. Create a user 'TVerstiy' on the machine running TVersity. Add that user to the 'Administrators' group. Go to Control Panel / Administrative Tools / Services. Double click the 'TVersityMediaServer' service. Change the log-on account to 'TVersity'. Note! Use a proper password for the TVersity account! Obviously there's no issue if you have all media files and TVersity on that same machine. Sometimes a .WMV file may not show up under its filename (I don't know if this would happen to other files as well)... If this is the case then check the 'properties' of that file. On one of my .WMV files there was under 'Properties / Summary / Simple' a name in the 'Title' field. Removing that name fixed the problem. Some sources suggest temporary files are only created when TVersity is transcoding stuff, but this seems to be wrong. I've seen it creating temporary files when simply streaming. TVersity (Pro) has a very interesting feature: it can transcode media files to another format on the fly. If your device doesn't support the provided image format (because for example your TV is too old, or something similar) TVersity will convert it into something else. There is a file profiles.xml involved which is way to complex for me, but I hope some of the items below can help you getting started. Unfortunately the TV's software isn't too great, but hey, at least I got something working. The setting above would affect all devices, so here's the second approach: leave TVersity on automatic, assign manual IP addresses to troublesome devices and change the file profiles.xml accordingly. Look for the file 'profiles.xml' in the TVersity program folder. Look in that file for the section that lists the suitable profile for your device (tip: use the 'friendly name' and start with 'alwaysvideo'). Add to that section a line with the FIXED IP address of your device(s). The profiles.xml file is pretty complex. I got my Philips TV 42PF9831 working by assigning it a permanent IP address, and adding that IP address to the profile "alwaysvideo". This effectively forced TVersity to convert anything send to my TV. Obviously, the higher the resolution, the more TVersity needs in bandwith and computing power. You can set the upper limit of TVersity's transcoding mechanism by adjusting Settings / Transcoder / Maximum Video and Image Resolution. If the file to be played has a higher resolution than the limit set here and if it needs to be transcoded it will be transcoded to the specifiied (lower) resolution. This might reduce quality, but 1. may make the file playable on your device, and 2. allows TVersity to run on machines with lower specs. The default setting is 320x240, but if you have the CPU power to spare you could try something like 640x480. Change it, play something, and check your CPU load using the Task Manager, it should stay below 100% if possible. Note that TVersity seems to run in 'blocks' when transcoding. On my test rig, running in a VM, it seemed to transcode in 'short blocks', ie. maxing a few seconds at 100%, then idling along until the next 100% peak. I'm not sure this is the normal behaviour though, or if it was simply a consequence of the way I set things up. Hold on. 640x480... Yeah, I know. That's not HD at all. Of course, this will only work if your server has sufficient CPU power to transcode anyway. Assuming you have an Intel Atom as a player, then you could add that player's IP address to the 'alwaysvideo' section, as I showed a little earlier. Assuming you have your files available through a share as well as through TVersity, you can now either play the file directly through that share, and if the Atom cannot handle it you can now play it through TVersity. You can set the max resolution of any file transcoded by TVersity, thus you can keep reducing the allocated bandwith and resolution until your Atom (or the server, for that matter) can handle it. The 'custom menu' option doesn't work well. Better go classic and set up a decent folder structure. You can access TVersity (and thus any media it is aware of) using any regular browser in your home network. Try the following links in your browser (adjust IP settings where necessary, obviously these links won't work on your machine unless your TVersity machine is also at 192.168.0.72). The whole purpose of TVersity is to offer transcoding, so playback in a browser does pretty much mean that you might (will) suffer loss of quality. This may be (partially) overcome by configuration and codec selection, I don't know. In addition, TVersity offers UPNP capabilities to software and hardware that is aware of it. I've noticed that TVersity sometimes misses one or more image files. If so, you'll need to hit the Refresh Media Library button. Go the DLNA route using BubbleUPnP + MX Player. I haven't checked out all options, especially not the option of creating your own DLNA profiles. Without a doubt that's the way to Video entertainment nirvana, but with DLNA clients getting smarter and smarter I've been statisfied thus far. Installation and configuration is straightforward. If you want to limit Serviio to video only, you'll have to clear the tick boxes for 'music' and 'images' on the Library / Shared folders' tab. I don't think it is possible to change the Serviio DLNA service name after installation. If you want to change it, just reinstall the program. Servio uses TCP port 8895 and UDP port 1900. Servio does transcode. Not that I have a clue how to set it up, it probably involves the aforementioned DLNA profiles. It seems to work out of the box though. The one problem that I had with Serviio was some standby issues under Windows XP. This might have been my particular configuration though. Update. Serviio is no longer entirely free. Sorry. Still need to check the implications of this solution. Not sure if it transcodes. Aka SqueezeBox Server aka Logitec Media Server. SlimDevices, SqueezeServer, SqueezeBox server. Whatever the name. It's the software that is part of the SqueezeBox solution of SlimDevices / Logitech. The software is actually free, as Logitech made money on the sales of their SqueezeBox devices, such as the SqeezeBox Classic, the SqueezeBox Touch, the Duet, and so on. These little gadgets allow you to stream music to your stereo without the need for a 'real' HTPC. It's actually amazing that none of the stand-alone 'mediaplayers' offers a good display and a set of buttons on the front face, effectively putting LogiTech out of business. If prices of tablets keep going down... A cheap tablet with ethernet and SPDIF might be the ticket. Update. Logitech no longer sells SqueezeBox devices. You might want to pick one up second hand. an iPod docking station with digital out (does that do FLAC? Note that players may not always be able to find your SqueezeServer by its name, sometimes you may have to explicitly use its IP address in your player(s) to be able to connect. Through the SqueezeBox Sever Control Panel you can specify the folder that contains all your music but as far as I can tell, it is only possible to specify one folder. If you want to include other folders you'll have to place a shortcut to your additional files right in that source folder (I've not tested this though, to be honest). If you need to transcode (for example Flac to MP3, for downloading to a SqueezeCommander client, or stream over the internet) you need to install Lame as well. That will bring up the web interface. Now you can use the web interface to control whatever your SqueezeBox hard- or software player is playing. Here's an example of actual usage: on the left there's VNC, showing me the desktop of my HTPC, which is running SqueezeSlave. It could have been a real SqueezeBox as well, but I haven't got one (yet). On the right there's a VIrtualBox VM, on which SqueezeBox server runs. Then in the middle there's a FireFox session (which could be running on any machine in the network, or another browser on a handheld device) showing the SqueezeBox aka Logitech Media Server user interface, which controls whatever is played. That sounds like a lot of troubles, but it actually is a lot easier. The complex setup above is because I was trying to figure out how things worked, before starting to spend some serious money on it, here's another look at it: think of it as three different roles... First there's all the music stored somewhere (the server or storage), then there's the software or device that plays the music (the renderer or player) and finally there's one that controls what is played (the controller). Splitting out the three roles starts making sense when you're using a hardware playback device such as a Squeezebox, and / or have your music stored somewhere centrally (away from the living room and / or accessible for everyone on the network). Simplest: a PC with jukebox / music player software (not SqueezeBox). In my test setup, I was doing things the difficult way, running the SqueezeBox server software on a VM, and running SqueezeSlave on the HTPC. There are a few software players available, SoftSqueeze, SqueezeSlave and SqueezePlay. I've tried all of them and they work fine. You could also try MP3 streaming. You could access SqueezeBox Server from the Internet, but I'm not so sure that's a good idea, security wise. Applications can talk to the SqueezeBox server, and control the connected clients, by communicating with port 9090. Update. ImageBank is now called PhotoStreamr. Still works the same. ImageBank allows convenient access to all images on your server, right from the iPad. Especially for those technologically challenged (spouses, unite! :-)). ImageBank required installation of Java on your server. It suggests to install 'Bonjour' but everything here worked fine without it. When running the iPad side, I just specified the IP address myself, and from there things worked right out of the box. ImageBank, unfortunately, is not an entirely 'clean' program. It won't run as a service, and when you start it a second time, it complains about a previous instance already using its designated port, and finally the server side programs for Android clients and iPad clients are different, but won't coexist. That's a pity, because I would have liked to access all images from an Android device as well. Another (minor) gripe is that you can't specify a password for 'Internet access only'. It would have been nice if local access (to a specified port) would not require a password, whilst access over the Internet (via a different port, forwarded from your router) would. That would add just a little more security to block unauthorized access to your images collection. At the moment you can set a password, but then local users must also always enter it, which is inconvenient... And (this may be my setup) why isn't the program always asking for a password? Weird. In spite of that, it's probably still your best option. You'll find software for the server here: http://www.photostreamr.com/. After installation it will ask you to install Java. There's no way around that, as this server application is written in Java. Your browser will open and you will be taken to Oracle's Java website. If the download button doesn't work, you'll have to go to 'See all Java downloads', then select the right file. This program, together with its client StreamToMe on the iPad, allows easy access to all video files on your server from an iPad. Another option would be the use of a DLNA player on the iPad, but I found this solution easier. The newer versions of ServeToMe can install as a service. Unfortunately, it allows jumping through some hoops if you do NOT want to install iTunes. I think you're better served (pun unintentional) by installing AirVideoHD. Just like ServeToMe this application allows streaming video to your iPad. The big difference is that on AirVideoHD allows server side transcoding in combination with downloading for offline viewing. In other words: with this program you can copy movies from the server to your iPad, and watch them later at a convenient moment. You can set the quality level to match the smaller iPad screen. It would have been great if there would have been an Android version, or equivalent program. Calibre doesn't exactly belong on a HTPC. 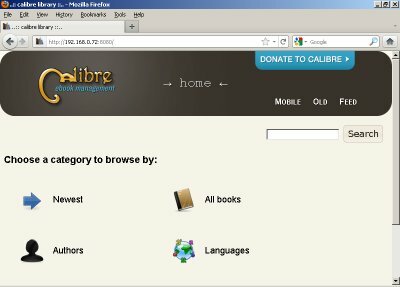 However, once you start moving all your data over to a 24/7 running server, you might encounter that forgotten stack of ebooks... Well, if you're using an iPad or something similar and you want to add a couple of ebooks to your device just before leaving home, and you don't want to launch your PC, then you could consider installing Calibre. Again, it just may not make that much sense, but that's all up to you :-) I've just added a few notes here how to install and run Calibre on a machine, but nothing extensive. Some things you'll have to figure out yourself. You may have to set up an exception in your firewall for the port Calibre uses. Calibre creates a copy of each ebook or other document you feed it, and stores it in its own 'database'. This leaves you two options: either use Calibre to manage all your ebooks, or only use Calibre as a reader and conversion tool and hold on to a manually maintained folder / file structure. If you use Calibre as your one stop solution, make sure you put the ..\reader_data\calibre folder somewhere where a. it can grow, and b. you won't forget to backup it. If you prefer an old fashioned folder structure and do not want to rely on Calibre for organising your files, then remember to empty the Calibre library now and again, as you might end up with countless duplicates. It's all a matter of choice and taste. ... and then you can download any of the ebooks known to Calibre. (The IP address 192.168.0.72 is the one my test setup uses.) Note that there is no online (browser based) module to read the ebook. You'll still need software locally (such as Calibre :-)). Using Calibre in a media server setup is a little tricky. There is no real option to have the database 'et al' located on your server and run muliple Calibre clients on different PC's, grabbing books from your home server whenever required. So you might consider simply leaving Calibre local, and perhaps organize your ebook collection the 'old fashioned' way in a folder / file structure. Is the Calibre content server of any use then? Well, actually, it is! (Though you might run it local for the same reason.) eBook readers like Stanza on the iPad do not take into account the actual file name. So, if you have a complete series of books, you won't be able to figure out in what sequence you should read them, and (on the iPad) it's a little cumbersome to transfer them to your device. By browsing to the content server (ie. using Safari, not using Stanza itself) on the iPad, you'll end up with a nice list of all books, properly sorted, thus making it easier to pick and download the right volume. Calibre wasn't entirely designed with a home server in mind. If you keep your database up to date locally, and you need to kill a remote content server, copy all to a server, then restart the content server, you're entering advanced territory. The information here (XP) and here (Windows 8) regarding remote tasks might help you a little. Specialists and advanced users only. Note that BubbleUPnP seeems to use or need port 1900, which may play havoc with, for example, Plex. You may have to pick one and drop the other. Streaming video to a ChromeCast has its limitations. The ChromeCast only supports a limited number of (video) formats. It should be possible to tell TVersity to serve the proper file format to a ChromeCast, but I ran into several issues. To simplify matters I choose to install the BubbleUPnP server application, which (together with some changes of the settings on the Android app side) fixed all the issues. Inside the BubbleUPnP android app, you will find a dedicated section with ChromeCast settings. Here I changed 'Video Encoding Speed' to 'Veryfast' and 'Max Video Bitrate' to 3000. THat fixed it for me. Inside the BubbleUPnP app on the server. This setting affects non-ChromeCast playback, so I did not touch it. Inside TVersity you can change some transcoding settings. I left these mostly (I think :-)) to default settings, with screen resolution limited to 1280x720. Use 'Wireless B' and Connection Quality 'Medium' if the playback is choppy. On my Pentium homeserver these settings worked fine, even for the worst files I could find. (I have a poorly encoded, overly large game teaser trailer for Wildstar that causes serious CPU load and bandwith issues, always a good test :-)) Also try to play-back a ripped 4GB iso DVD image. Note: TVersity encoded in bursts, and pauses in between. When using Task Manager on your server you should see the CPU maxing out for a minute or so, then dropping a bit, then processing again. If the CPU load stays continuously at 100% your settings are too high and / or your CPU is not powerful enough. With all those different URL / IP adresses and ports, I started to lose track. To make live a little easier, I installed a very small web server on my media server. Anyway, Plex itself installed fine and ran the first time. You'll find the documentation here. Compared with TVersity UMS needs quite a bit more processing power. (Perhaps because it is written in Java, or because it has to interact with some external libraries? I have no clue.) A recent dual core Pentium would handle multiple streams when using TVersity, but can barely handle a single stream in UMS. In fact, I had to change 'Transcoding quality' to 'Automatic (wireless)' or it would stutter. If you need transcoding multiple streams simultaneously I would suggest as a minimal CPU an I3 (quad core) with 4 GB of memory. Any of the new AMD Ryzen chips would probably work just fine. Hardware encoding on the Intel side might be a tad better, but isn't always supported. By default the DLNA server uses port 5001 and the web interface 9001. If you have other applications using those ports you may have to change these. Unfortunately you can set the DLNA port in the regular user interface but cannot set the web port. If you want to do so you'll have to change the file C:\Users\All Users\UMS\UMS.conf. You can also edit this file using 'General Configuration / Edit UMS configuratiion file manually'.